With his brand new album having just hit the shelves (and the servers) we caught up with one of the busiest artists at this years Ramblin’ Man Fair for a chat and a beer in his airstream caravan conveniently placed in the middle of the arena. It’s been out for a couple of weeks now. We’ve been really busy touring since the last album and started on the new album back in November last year and we had a week in the studio and then were mixing for ages afterwards. My time seems to be taken up so quickly these days I’m just so busy. It’s receiving some very good press. The reviews have been amazing. I feel like everybody has been so super kind. For me, I wrote the album that I wanted to hear and I put it out and hoped a few people like it, and the reaction has been fantastic. I’ve been overwhelmed. Every day it seems that there’s another review giving it 9/10 or whatever. A few of the reviews seem to pick up on different tracks which is always a good sign. Have you had much feedback from the fans yet? This is the really interesting thing and we’re getting a lot of this coming through on social media, and everyone is picking out different songs. I think different songs appeal to different people and they hear different things in there. I’m not quite sure how I’ve managed to pull that off. It seems some of it is very personal – how much is autobiographical? A lot of it is autobiographical and the rest is dragged up from the dark depth of my imagination, and I like to put it out there and let people decide which is which. You’d probably be surprised which is which. Some songs are really personal, ‘Friday Night’s Alright For Drinking’ – every single line in that song is something that has happened to me, and that almost wrote itself. You’ve also become known for your creative videos..
Yeah – we have to be creative as we generally don’t have a budget for videos. That was my idea – I just locked myself away in a room for six weeks and played with Lego. It was great. The idea of standing around on a stage with smoke blowing around is cool but I can’t really sell myself like that so I have to try and come up with something a bit different. So you don’t fancy going all Steel Panther and leaping around in spandex to attract an audience? Haha – I don’t think so, but now that you’ve suggested it and put the idea in my head. Watch this space!! So you’ve got a busy weekend ahead..
Yeah. I’m doing a solo acoustic thing in the VIP tent later today, and I thought that that was it, and I could chill out. I’m looking forward to Mott The Hoople tonight. Tomorrow I’m compering on the blues stage and one act I was looking forward to introducing was Chas & Dave. I’ve seen them before and they were absolutely fantastic. Unfortunately because Chas is unwell they’ve had to pull out, but the silver lining is that Ramblin’ Man asked if I could fill their spot, and I’ll take every opportunity I can. I played here last year and afterwards on my tour every single night someone came up to me and said “I saw you at Ramblin’ Man”, so I’m really glad I could get the band here for this. I certainly hope so. I was really looking forward to watching them. 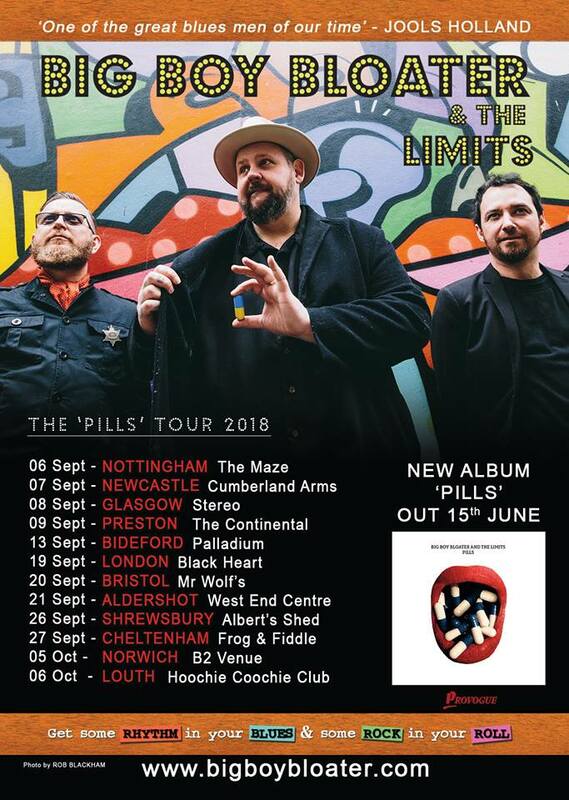 The Pills tour goes on the road in September, do you have any favourite venues or is there anywhere you’re particularly looking forward to playing? We’ve got about 12 or 13 dates up and down the motorways of Britain. Aldershot at the West End Centre is always a favourite of mine as it’s a hometown show, and Glasgow is always a good show. The crowd really get stuck in, but I’m looking forward to playing all the dates and getting stuck into the tour. Shrewsbury’s a new one and the Maze in Nottingham is a great venue – a spit & sawdust venue, just how we like them. 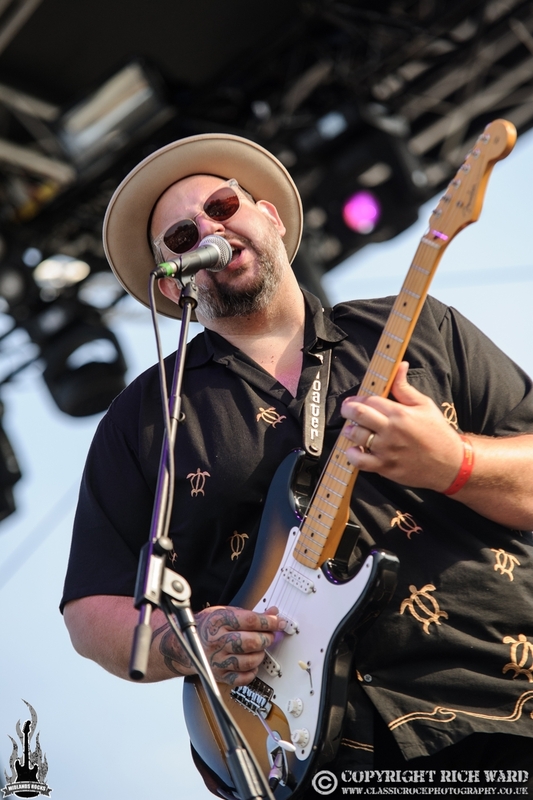 Ramblin’ Man has always had a focus on the blues with a separate stage. How do you see the scene and the Limits fitting in? I think the blues scene at the moment is really strong. There’s a lot of great bands and the support for it, but for me I don’t think that there’s enough originality going on. It’s always good to have a new band come in and shake things up. I don’t see myself as blues as there’s a lot of other 70s influences like T-Rex and Mott The Hoople who I’m really looking forward to later. I’d like to see someone go out there and do something a little bit different. I guess that’s what I’m trying to do.